While trendy Valencia Street nightspots were filled as usual last Wednesday night with San Franciscans blowing off steam after work, a community that has been gaining steam for years met at Centro del Pueblo to engage in a historic discussion. Thirteen community-based organizations – now under the name United to Save the Mission – collectively decided a plan of action with over a hundred residents. The topic: affordable housing. Specifically how the money from Prop A, passed last November with 75 percent of the vote, should be prioritized in the Mission. Prop A was the first housing bond passed in San Francisco since 1996. The total of this bond – put forth to address housing-affordability issues in an increasingly costly market – was set at $310 million. Of that money, $50 million was earmarked for the Mission, the neighborhood hardest hit by the housing crisis. As proof of that statement, consider that a mere 7 percent of housing in the Mission’s pipeline is set as affordable, well under the City’s stated target of one-third. A report entitled “An Assessment of Housing and Housing Affordability in the Mission Promise Neighborhood” offered some specific numbers. This report estimated that 2,400 low- to moderate-income residents’ units be retained or replaced to maintain the Mission as a working-class neighborhood and Latino cultural hub. The goal of last Wednesday’s meeting was to ensure that the community has a say in how this $50 million will be spent, as part of a plan to make the above happen. This community meeting also represented three years of community advocacy and solidarity, ranging from street rallies and individual political actions to grassroots organizing and filling City Hall to the rafters to demand aggressive solutions. 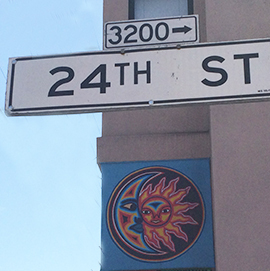 MEDA, the lead agency of the Mission Promise Neighborhood, played an integral part by leading the creation of the Mission Action Plan 2020 (MAP 2020). A central piece of MAP 2020 was the implementation of an ongoing series of monthly meetings, since April 2015, that serves as a forum for City staff to directly request community input in funding priorities for affordable housing in the neighborhood. The clear growth in the community’s power was then demonstrated last summer by the speed in which signatures were gathered for Prop I, the pause on luxury housing in the Mission District. Prop I made it to last November’s ballot, and while the measure garnered major support in the Mission, it unfortunately did not pass because the “Yes” side was vastly outspent by developers on the “No” side. Despite this loss, a movement was solidified. This momentum of this movement led to a neighborhood having the impetus to put collective pressure on elected officials to allocate more funds to the Mission for affordable housing. The advent of this movement has been loss, real and anticipated, of a community no longer feeling they will be able to remain part of their neighborhood of choice. These feelings are based in fact, as the Mission has seen dire displacement of low-income and working-class residents (8,000 in the past decade, with the majority Latinos). Those most vulnerable to housing instability are homeless individuals and families, very low-income people, those with children, transitional-aged youth (18– to 24-year-olds), seniors on a fixed income and persons living with disabilities. Many in attendance last night met these demographics. They came because years of action had led to their knowing that they will represented – that they now have a say in their future. There were four options presented to the community, with detailed explanations given for each and questions answered. This was done via small-group discussions, in Spanish and English. Based on the group discussions, community members then cast votes for their priorities. The community decided the priority should be to buy land and build now. The second choice was to buy land and build later. In third was the rehab of existing Single-Room Occupancy (SRO) hotels. There is a follow-up community meeting next week to determine how to present last night’s prioritization to the powers that be at City Hall. United to Save the Mission will deliver this message on behalf of the community. Manuela’s voice has been heard … as has a community’s. Interested in volunteering for the MPN Survey? Email us. SAN FRANCISCO (KGO) — People, who live in San Francisco’s Mission District, may get an unexpected knock on the door from people conducting a survey. The purpose is to assess the needs of low-income families with children in local public schools. Monday at 9 a.m., several teams with orange vests and clipboards in hand were out conducting the survey. “So, we’ve divided the neighborhood into zones so that we can go survey these areas, where there is a majority of families that go to our four Promise schools,” said MEDA Director of Evaluation Carolina Guzman. Those so-called Promise Schools are participating in a federal program where the goal is to guarantee that children in the Mission have the necessary tools to succeed in school. For the next five weeks families will answer a long questionnaire with topics ranging from health care, to housing and the quality of their schools. The families are predominantly Hispanic. “This is about how to figure out, how to improve schools and our services so that children, you know, go to school ready and graduate and go to college,” said Guzman. The survey is being done by MEDA, the Mission Economic Development Agency and funded by the United States Department of Education. The findings will help MEDA and its partners decide where help is needed and how to fund programs to support these children. “The interview went really well, I think. 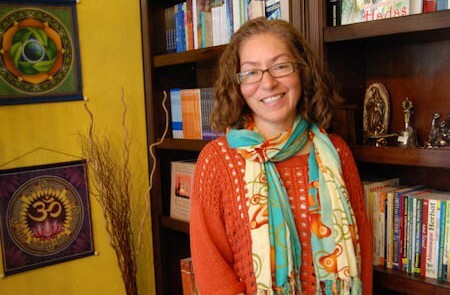 She was very happy to share information,” said MEDA staff member Teresa Morales. But, today not every family was willing to be so forthcoming. Some were not at home or didn’t feel comfortable participating. “And, we had some other people say they would make appointments in the future for us to come back but they weren’t available at the moment,” said MEDA staff member Richard Abisla. “They have a packet of information that they can leave, right away, so if you have any questions my phone number is in there so they can call me. But, yeah, we’re asking people to, ‘please hear us out a little bit and learn about the survey,'” said Guzman. MEDA will conduct three surveys over the next five years to see how much progress is being made. The Mission District will be awash in a sea of orange starting today. No, it’s not that autumn came early this year. 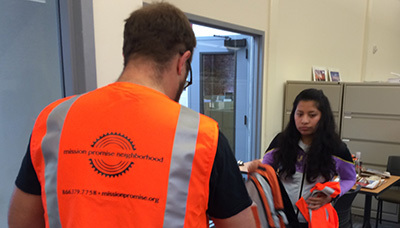 It’s actually the sea of orange vests and backpacks worn by the zealous teams conducting the Mission Promise Neighborhood (MPN) survey of 1,000 households in this primarily Latino community. Bilingual duos will be visiting homes in a rectangular area bordered by Duboce Avenue to the north, Cesar Chavez Street to the south, Portrero Avenue to the east and Dolores Street to the west. This extensive survey was coordinated with Harder + Company Community Research, tapping into Vice President Kym Dorman’s advanced skills in qualitative and quantitative research methods. MPN, a program overseen by the Mission Economic Development Agency (MEDA), is one of just a dozen such federal programs in the entire nation. The goal is to take children on a cradle-to-college-to-career continuum, based on results-driven data of family success. Ascertaining the issues affecting these families, via a broad survey, will help MPN better target services and address community needs. The first group left MEDA’s Mission neighborhood center, Plaza Adelante, this morning, fully trained and armed with surveys. Questions will be asked about children’s issues, nutrition, housing and fiscal matters, with all queries answered anonymously. While the federal government mandates that a consent form be signed, it is not tied to the survey, as the latter has no name attached. The MPN survey will take place through May 30th, so you may hear a friendly knock on your door this spring. 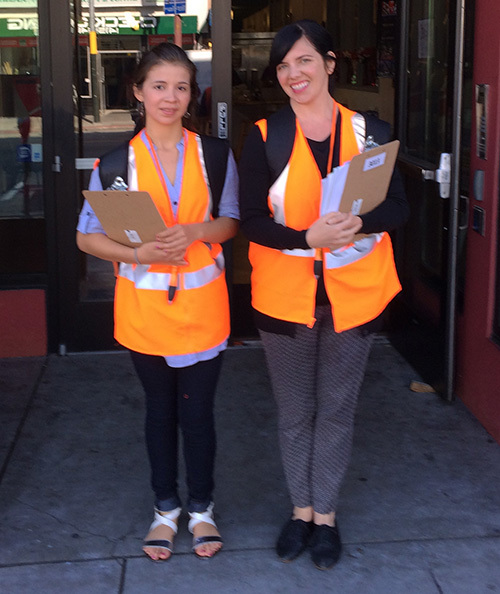 Thanks in advance to the Mission District for welcoming these MPN surveyors so that they can gain a more comprehensive understanding of what is going on in the neighborhood. This is possible only as a joint effort between MPN and Mission District residents.